Alfred and Jerseycot Apricot have blooms open today, Zard is close. My Zard is probably too small to let fruit, I just bench grafted it last year. 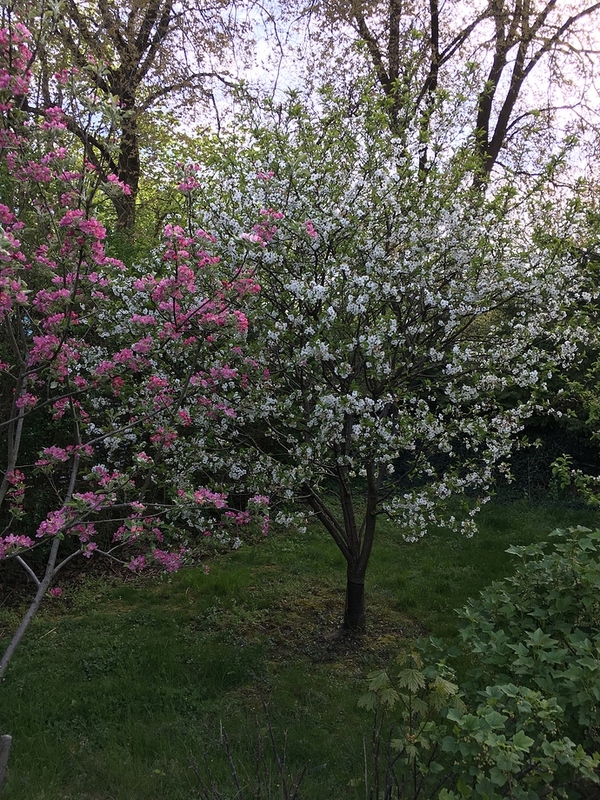 Alfred is decent sized but only has about a dozen or so blooms, Jerseycot has more and is one year older, planted in 2015. My second tree planted and still my favorite. It’s my second one. My first one is in to much shade behind my Bing tree. I was going to dig it up but I saw this tree earlier in the week and figured for the price why not just plant another one. 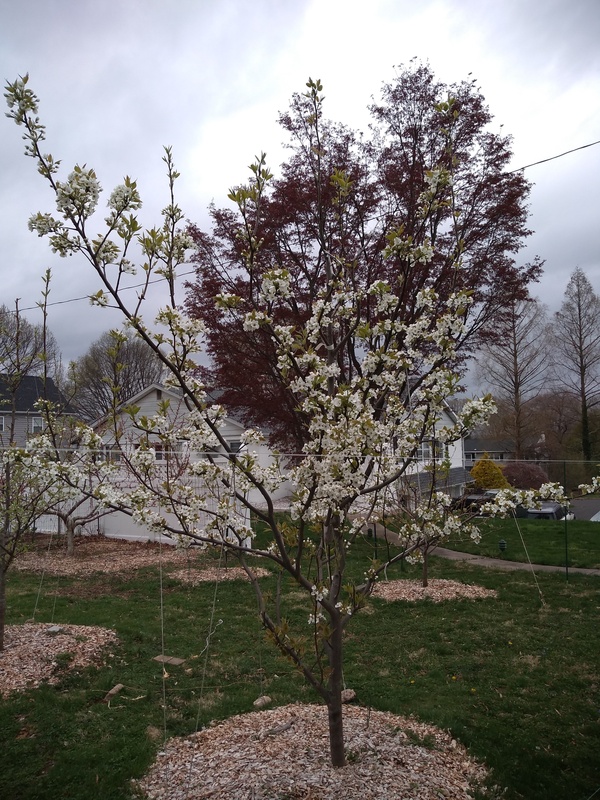 My first one I planted my first year planting fruit trees in 2012. I favored the sweet cherries for the sunny spots. This one is out more into my back yard up by the house where my big apple tree was. It still will only get about seven hours of direct sun, but I would have to start cutting trees down to get more sun. The 100’ tall type, lol. I hate that I have to put them in cages till they get big enough. I need to throw mulch in there yet before the buds break. I was going to do it tomorrow but now it’s going to snow and rain.I put some cow manure on top of the ground, and just a little bit in with the dirt mixed well. In 13 years you will have this! It is the white blossomed tree. Cannot wait till it blooms this spring! Sweet, I can handle that! 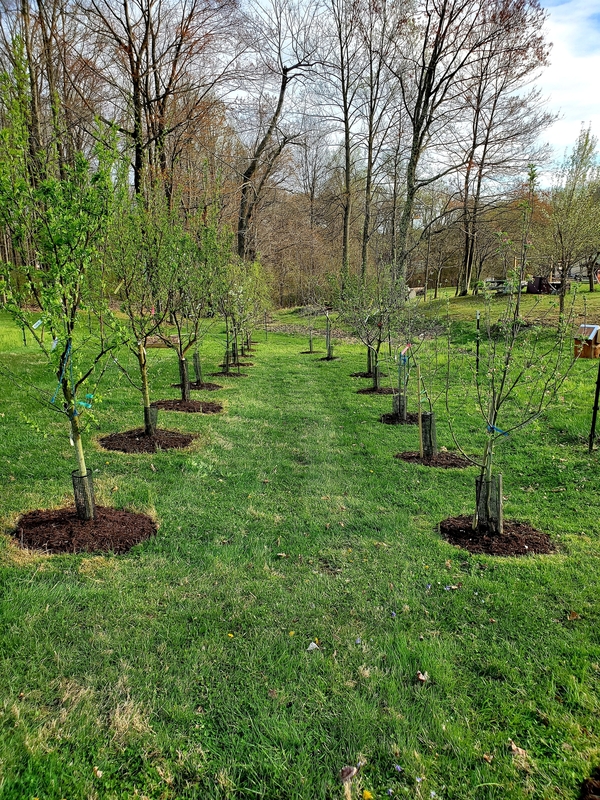 I cleaned up the orchard a bit today, top dressed with some compost and some fresh mulch. Finished my grafting as well. Now to clean up my blackberry and raspberry run. Your yard looks magical! Makes me think of fairies. @speedster1 Your orchard looks great, so neat and orderly. Your trees look close together- will they stay pretty small do you think? Thanks. Yes my trees are close. In hingsight too close. They are on 8-10 foot spacing. Wish I wouldve went with 12 feet and a wider row but it is what it is. I keep them small becuase of that. Katie the trees are up to six feet apart. Its the branches when they spread that make them look closer together. My property is almost an acre and the orchard is on the second part of my lot. House is for sale, so not doing much in the orchard except pruning and maintenance. Are you moving pretty far away, say to a different zone? Will you replant once you get where you’re going? Your orchard should be on better homes and gardens! 8 apple, 2 sweet cherry, 2 pluot, 2 japanese plum, 1 cherry-plum, 2 asian pear, 1 euro pear, 1 peach, and 1 apricot are in this group. All but one of these trees are grafted at least once but in some cases up to 10 times. 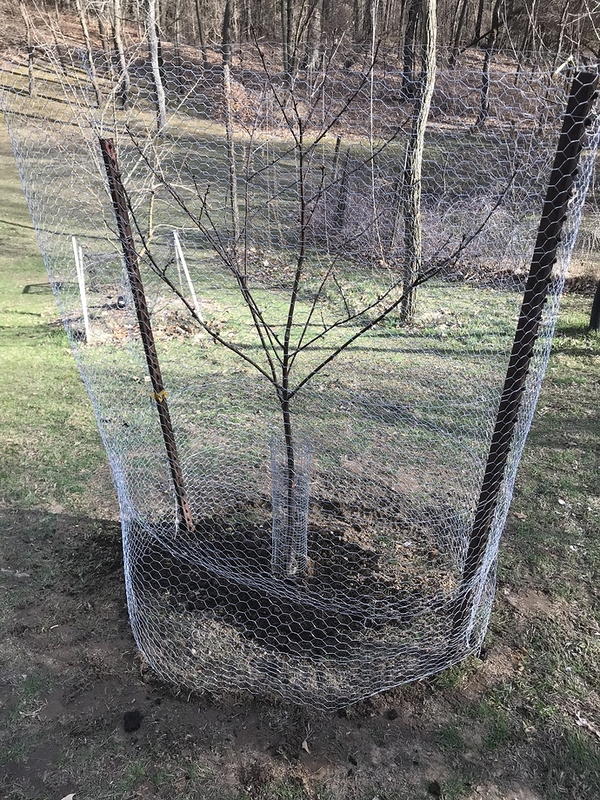 In other parts of my property I have unfenced individual trees that im allowing to grow larger. They include a Nectaplum, another heavily grafted japanese plum, a jujube, Issai Mulberry, Juliet and Carmine Jewell. 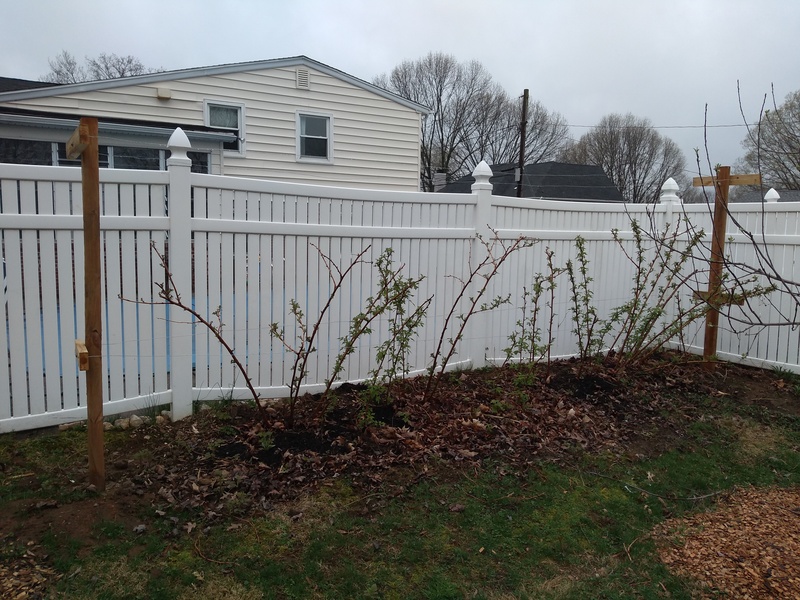 I also have some blueberries and Nanking cherry bushes and a raspberry run. Got a ton done this weekend. 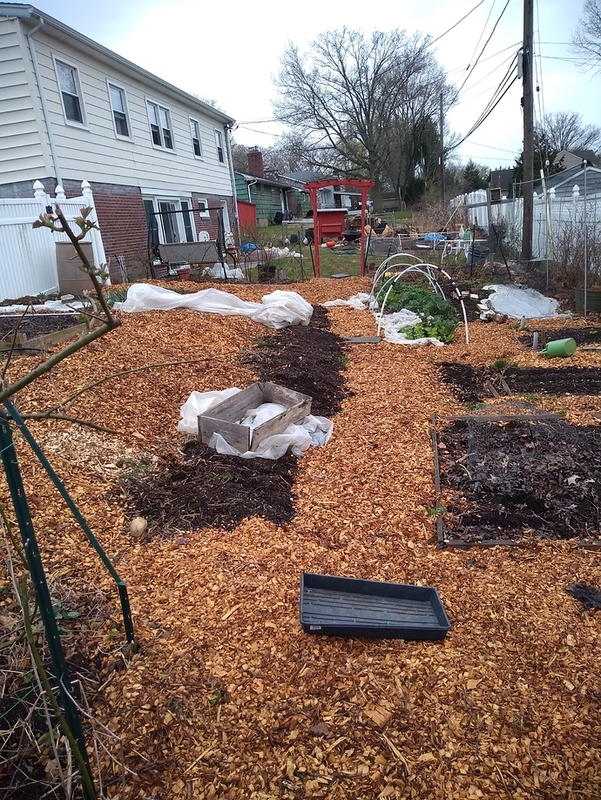 Moved about 5 yards of wood chips into the garden. i just love wood chips! feels nice walking on them. like walking in the woods. barely have to water at all. It really makes gardening easier. All that shoveling is good for the heart too. I’ve been staking trees and tying them down with 3/8 Rebar, but it isn’t cheap. What are you using @growjimgrow? I found some old metal things used to hold down tarps and tents. They screw into the ground and have a loop on top and work great. They were also free from my dad’s garage. I also use bricks and stones. For the rope, I use last years clothes line cotton rope. After a year of holding clothes, it looses its elasticity so won’t stretch much. It also is soft enough that it doesn’t girdle the trees if the branches get to big.